What Milton Friedman Actually Said About Illegal Immigration. There has been a lot of purposeful distortion, and some confusion, over what Milton Friedman actually said about immigration. He is often misquoted by xenophobic activists. What they don’t do is quote him in his entirety. They stop before he clarifies what he means and that is why I think they are dishonest. I have heard Dr. Friedman on several occasions and I’ve heard him address the immigration issue. I clearly remembered his clarification during a speech I heard him give at Stanford University. But, all I could do was broadly state his comments without giving a precise quote. Now, thanks to the DVDs that Fr33minds is offering, I have Friedman on video stating precisely what he believes about immigration. And, instead of giving you half quotes, which is what the anti-immigration crowd does, I want to give you his precise words. What follows are direct quotes from Friedman in his lecture, What is America. You had a flood of immigrants, millions of them, coming to this country. What brought them here? It was the hope for a better life for them and their children. And, in the main, they succeeded. It is hard to find any century in history, in which so large a number of people experience so great an improvement in the conditions of their life, in the opportunities open to them, as in the period of the 19th and early 20th century. Friedman then went on to discuss the institutions that are necessary to allow people to become prosperous before ultimately returning to immigration. He mentions how regulations strangle the ability of people to do good things. And he said he’d like to take, as one example, the issue of free immigration. What’s the difference? How can people be so inconsistent? Why is it that free immigration was a good thing before 1914 and free immigration is a bad thing today? Well, there is a sense in which that answer is right. There’s a sense in which free immigration, in the same sense as we had it before 1914 is not possible today. Why not? Because it is one thing to have free immigration to jobs. It is another thing to have free immigration to welfare. And you cannot have both. If you have a welfare state, if you have a state in which every resident is promises a certain minimal level of income, or a minimum level of subsistence, regardless of whether he works or not, produces it or not. Then it really is an impossible thing. Up to this point it sounds as if the xenophobes are quoting Friedman accurately. Of course, they leave out that bit at the beginning where Friedman said to the immigrants in the audience that they are a new wave of immigrants who “we ought to be welcoming.” But, Friedman isn’t finished with his comments. When I heard him at Stanford he said pretty much the same thing as he’s saying here. He then clarifies himself in a way the xenophobes never quote! If you have free immigration, in the way we had it before 1914, everybody benefited. The people who were here benefited. The people who came benefited. Because nobody would come unless he, or his family, thought he would do better here than he would elsewhere. And, the new immigrants provided additional resources, provided additional possibilities for the people already here. So everybody can mutually benefit. But on the other hand, if you come under circumstances where each person is entitled to a pro-rata share of the pot, to take an extreme example, or even to a low level of the pie, than the effect of that situation is that free immigration, would mean a reduction of everybody to the same, uniform level. Of course, I’m exaggerating, it wouldn’t go quite that far, but it would go in that direction. And it is that perception, that leads people to adopt what at first seems like inconsistent values. Now Friedman goes even further with his clarification. And pay special attention to what he says here. Look, for example, at the obvious, immediate, practical example of illegal Mexican immigration. Now, that Mexican immigration, over the border, is a good thing. It’s a good thing for the illegal immigrants. It’s a good thing for the United States. It’s a good thing for the citizens of the country. But, it’s only good so long as its illegal. 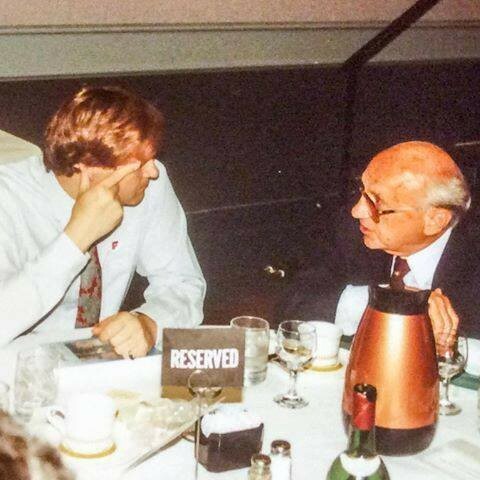 The author with Milton Friedman. There is no question that Milton Friedman said that in the welfare society “illegal immigration” is precisely the kind of the immigration that the country needs. The xenophobes have turned his views inside-out. They will pay lip-service to legal immigration and damn illegal immigration. The fake libertarians, social conservatives, and racists try to make it sound as if Friedman was against illegal Mexican migrants. In reality he said that such immigration is “a good thing” for everybody concerned. His reasoning is that this is the closest thing to pre-1914 immigration possible in today’s welfare state. Friedman says this is the paradox of government intervention that turns an illegal act into a beneficial one, while legal immigration is a potential problem. Notice that the groups that quote Friedman never quote him saying that illegal Mexican immigration is good. That’s an interesting paradox to think about. Make it legal and it’s no good. Why? Because as long as it’s illegal the people who come in do not qualify for welfare, they don’t qualify for social security, they don’t qualify for the other myriad of benefits that we pour out from our left pocket to our right pocket. So long as they don’t qualify they migrate to jobs. They take jobs that most residents of this country are unwilling to take. They provide employers with the kind of workers that they cannot get. They’re hard workers, they’re good workers, and they are clearly better off. Friedman’s position is exactly the one I remembered from his Stanford lecture. The opponents of immigration, who attempt to use Friedman to bolster their case, are dishonest in the way they do it. They distort his view, and cherry-pick comments that sound good to their case, while ignoring the actual clarification of his views Friedman made a special effort to express. In addition, they don’t ever propose Friedman’s solution. They merely say the only possible choice is to stop immigration to the United States. There are three options that we can take consistent with Friedman’s view, and the xenophobes reject all three of them. First, we could abolish the welfare state entirely. They assume this won’t happen anytime soon, so acknowledging this position is a safe one for the racist, since it is unlikely it will mean immigration by “those people” any time soon. The second option is actually quite easy to implement. That is to selectively abolish welfare benefits denying them to any immigrant. This denial could be for their lifetime or require them to be gainfully employed for X number of years before they qualify. This solution, which is feasible now, is not one suggested by the “libertarian” anti-immigrant crowd. It is not suggested precisely because it is possible now, and might actually lead to immigration. What these people oppose is not the welfare state as much as it is the immigrants. The third option is one txenophobes have actively campaigned against — and that is illegal immigration of migrants across the Mexican border. This is the one that Friedman specifically said was “good” for the country, the American people and immigrants themselves. Now you know what Milton Friedman actually said. If you wish to support these columns visit our page at Patreon. James Peron is the president of the Moorfield Storey Institute, was the founding editor of Esteem a LGBT publication in South Africa under apartheid. A blog for the Moorfield Storey Institute: a liberaltarian think tank.